(1) ARTEMIS IS NOT THE EXPANSE. Ioannis Kokkinidis gives an analysis of how realistic Andy Weir’s Artemis is in “The polis of Artemis on the Moon” at Centauri Dreams. Over the years many rationales have been given to colonize the Moon. This is the only story I have read – granted I have not been able to read that much science fiction – where tourism is the primary driver of colonization. Andy Weir has said that he first created an economy of the town and then went on to write the novel. His description of a tourist dependent city though has several assumptions that, while mostly true for some American destinations, are quite odd for tourist destinations outside the US. This is an analysis by a person who comes from a country whose economy is highly dependent of tourism, has visited some 30 countries and lived in 5 of them. I am trying to keep this review as spoiler free as possible so as not to ruin the enjoyment of the book to anyone who has not read it, though I hope that those that have not read the book will be able to follow my arguments and form their own opinions. Kokkinidis’ article includes the surprise that Andy Weir and James S.A. Corey (aka Daniel Abraham and Ty Franck) have agreed that his stories are set in the same universe as The Expanse series. Or not, says Greg Hullender, who sent the link along with his own research into the matter. I love The Expanse – fantastic stories. But no, The Martian and The Expanse are not in the same continuity. They just threw in the reference for fun. I’m honored. It was a friendly joke at SDCC a few years back. Andy’s awesome, and we’re fans. I think we can keep the copyright lawyers in their cages for the time being. Ah well. It was a pretty idea while it lasted. (2) DOCTOR STRANGEMIND. Kim Huett of Doctor Strangemind takes the recent controversy over Terry Goodkind’s criticism of cover srt on his new book as a starting point for a dive into sff art history, “Author Vs Art”. His insides – i.e. interior illustrations in the magazines are ailing. And have been for many a long year. Much black-and-white is crude, hastily-executed and poorly reproduced, and necessarily limited as to size by the digest format of the pages on which it appears. (4) NEW BAT CHANNEL. George R.R. Martin has moved his blog off of LiveJournal. Here’s the link to the new URL for Not A Blog. (5) FREE COMICS. Free Comic Book Day is coming May 5. (6) REAL LIFE PODCASTING. Cat Rambo shares a… pro tip? Confession? Waiting to tape a podcast and another episode of the host saying "There seems to be a lot of noise at Cat's end, do you have a window open" and me saying "yes I live on a major street that is indeed a fire engine going by." 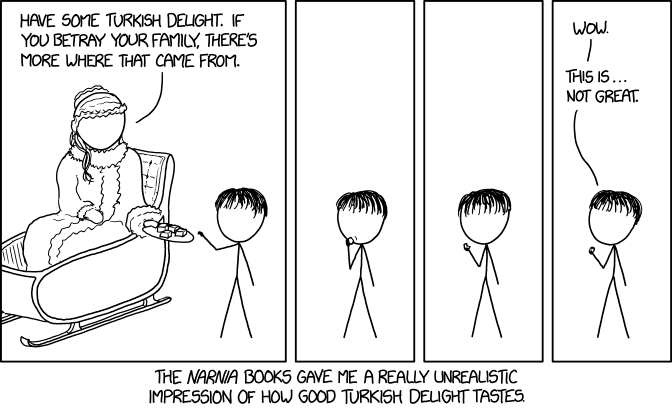 Cat Eldridge agrees with xkcd’s Narnian punchline about Turkish Delight. Still, Necco Wafers are not as flashy as more modern confections, like Reese’s Peanut Butter Cups or Baby Ruths. Naysayers have complained that Necco Wafers taste like drywall or chalk; time and again, the wafers have topped lists of America’s most hated candy. Be that as it may, Necco Wafers are suddenly having a huge revival. Why? Because the candy factory — the New England Confectionary Company, or Necco — that makes these deliciously despised candies may shut down. In March, Necco CEO Michael McGee told the Boston Globe that the failing company would be closing down — and laying off nearly 400 people — if it could not find a buyer. (9) A REAL SPACE MUSEUM. The BBC tells about : “The ambitious proposal to create a space ‘museum’ in orbit” — preserving the Hubble as an exhibit now that there’s no shuttle to keep refurbishing it. One of the most significant scientific endeavours of all time, Hubble is destined to burn apart as it re-enters the atmosphere in the early 2030s. It will go the same way as many other historic space objects – from the first satellite and Laika the space dog, to Skylab and the Mir space station. But there may be an “impossible” alternative. Rather than bring it back to Earth – a costly and challenging mission (successfully attempted by the Space Shuttle in 1984 with two communications satellites) – Eves is urging the US to preserve the telescope in space. Some authors can’t handle any amount of criticism of their work. One author complained about five negative words in thousand-word 5-star review which otherwise gushed over how great the story was. Another complained that a 5-star review praised their story for the wrong reasons. We can’t make everyone happy, and we aren’t going to try. A review should never be personal. “This story suffers from a weak plot” is okay. “This author can’t plot his way out of a paper bag” is not. A review should not pile on. Once I’ve cited enough reasons to explain why the story got a 2-star review, I should stop. There’s no point in trying to list 50 things that bothered me if 5 will do. (11) YANG AT HIGH TIDE. Joe Sherry covers three books in “Nanoreviews: Good Guys, Penric’s Fox, The Black Tides of Heaven” at Nerds of a Feather. Have you ever read a book and midway through you’re actively angry at yourself for not reading it sooner? That was me after maybe twenty pages of The Black Tides of Heaven. By the end of the book my jaw was on the floor in amazement at just how spectacular this novella is. Told over the course of more than thirty years, The Black Tides of Heaven is not quite the story of revolution, but it is more a story of politics, of family, of personal choice, with a bit of revolution in the mix. All of that, and more, is woven together to something that is far superior than any facile description I could possibly give. I’m not sure I am up to the task of properly reviewing thie novella. I can only give The Black Tides of Heaven my highest possible recommendation. (12) THE U.S. ARMY’S OWN MILSF. The IEEE Spectrum says “To Illustrate the Dangers of Cyberwarfare, the Army Is Turning to Sci-fi”. The books grew out of the ACI’s collaboration with the Threatcasting Lab at Arizona State University, in Tempe. Brian David Johnson is the director of the Threatcasting Lab and Intel’s former in-house futurist. He wrote the books—Dark Hammer, Silent Ruin, Engineering a Traitor, and 11/25/27—with Sandy Winkelman as creative director. “We do two-day threatcasting events where we…model possible threats 10 years in the future,” Johnson says. “Threats to national security, threats to the economy, threats to civilization. And once we’ve established those, then we look backward and say, ‘How do we disrupt and mitigate those threats?’ ” he says. A pepper-picking robot named Harvey is being developed by Queensland University of Technology with the aim of reducing crop waste. Moving between crop rows autonomously, the robot can detect when the fruit is ripe and picks the pepper with the aid of a suction grip and an electric saw. She calls this a “graphic survey” approach – drawing illustrations that put a face with the crowd-sourced quote – that would create a space for creatives to share their experiences. The goal of For Exposure, beyond creating a platform for frustrated creatives? It’s not only to arm them to be savvier – it’s also hold the people they work for accountable. This entry was posted in Pixel Scroll and tagged Andy Weir, Camestros Felapton, Cat Rambo, comic books, Daniel Abraham, George R. R. Martin, Greg Hullender, Hubble telescope, James S.A. Corey, Joe Sherry, JY Yang, Kim Huett, milSF, Robert Bloch, robots, Rocket Stack Rank, The Expanse by Mike Glyer. Bookmark the permalink. (3) Having talked to various people it looks like people are using iBooks as a money laundering scam. Apparently, this is common on Amazon as well. Create books (in this case by grabbing free books from Smashwords) and then over-pricing them. This way a criminal can have somebody pay them money by what appears to be a legitimate purpose. If that is the case, I’m surprised Apple are so indifferent to it. Copyright theft is one thing but they run the risk of being held as complicit in major criminality if they aren’t careful. 8. I’d be more upset about Sweethearts than the Necco wafers themselves, but I can’t actually *eat* either of them because of the corn syrup, or I’d totally have bought them. I will miss the idea of Necco Wafers and Sweethearts, with fond nostalgia, but haven’t actually consumed any in a very long time. (8) NIHIL NECCO? I’ve seen but never tried these scary-looking wafer things. It sounds like they make all the weird/old/chalk-like candy, though. Kendall says (7) COMICS SECTION. Here’s the permalink to the comic, where you can mouse over and get the “kicker” to the comic, as well. Actually, sometimes (as in this one) the kicker’s even funnier than the main part of the comic. ? I gave OGH the permalink and that’s what he used. On the iPad which is mouseless, swiping will, somewtimes, bring up the kicker. Camestros Felapton says If that is the case, I’m surprised Apple are so indifferent to it. Copyright theft is one thing but they run the risk of being held as complicit in major criminality if they aren’t careful. Like all institutions of their size selling ebooks, they depend quite a bit on someone telling them that it’s there and filing a DMCA takedown request for it gets their attention. Short of that, it’s not reasonable to expect any of the major ebook sellers to have enough staff to actively seek these out. Both agree the AMOC ocean circulation slowing and to the degree of it slowing. But both disagree on when this slowing started by about a century. The difference is probably that while both studies use field data, they relate that to models (which are both imperfect and varied). Bottom line. NW Europe can expect cold snaps in winters compred to the milder winters usually enjoyed. @Lis I completely understand. I suspect that neither taste anything near as well as I remember. But as you say, a local institution. 3) $40 for Cam’s blog posts? A Bargain at none of the price. I had never considered, Cam, for the practice to be a way to launder money. Hunh. The Street finds its own uses for technology indeed. 6) I have vehicles passing my apartment, its bothersome in warm weather when it is bloody hot in here and I need the patio door open to get some relief. 14) Ah, the “Day after Tomorrow” scenario, buit without the junk science. But this particular scam is relatively immune from that. They aren’t undercutting or giving away books that the author expects income from but instead selling a free book in a different market. The chance of it being policed by the author is low. Also the legal liabilities for enabling money laundering are both higher and different than copyright infringement. Title credits of the day, woo-hoo. Meanwhile, this might be of interest: The Egyptian science fiction author and translator Ahmed Khaled Towfik has died aged only 55. Camestros Felapton notes But this particular scam is relatively immune from that. They aren’t undercutting or giving away books that the author expects income from but instead selling a free book in a different market. The chance of it being policed by the author is low. But they are in violation of the DMCA which explicitly protects the copyright of the rightful holder of that legal instrument. Yes it’s a chance that the author will note that other usage of their work but it’s even less likely that any of the sellers will notice it. First you’d have to prove that it was indeed being used for such purposes. Even if a lot more copies than expected are selling they doesn’t prove is being used for that purpose. It’s really up to the author or website involved (Green Man has needed to file several times as we’ve copyright protect material that got used elsewhere) to get these practices stopped. 2. Amazing Stories is, among other things, dedicated to make its print edition resemble a “real” SF magazine, and that includes great cover art AND interiors for each and every story. We’re going to have a B&W illustration on the title page of each story, perhaps some additional interstitials for longer works and, in future, many of those illos will be in color. I really want readers to experience the same things I did when I was first exposed to the magazines in the late 60s, early 70s; a wide variety of fiction, new discoveries and images to look at long after the story has been read and re-read. A magazine is not a paperback in a slightly different print size…. 3. Camestros, yes…and the key is to find a direct connection to parent company. CreateSpace (POD) is a wholly owned division of Amazon; Amazon itself may not be responsible (owing to, what is it – safe harbor? ), but if createspace is printing PODs of infringing works, knowingly (as in, amazon is informed of the violation and does nothing), an ambitious attorney might be able to make a case to sue the parent corp.
(8) Necco Wafers were once my candy of choice, back when money was an issue. For four cents (Steele’s Cash Market discounted candy, among other things), I could have candy in my mouth for a good long time. I preferred hard candy for quite a while. It just felt like a better value. And I think they bought my dentist a boat. Necco also makes Mary Janes, a particular favorite of mine that I buy in small quantities once in a while in the bulk candy department. I noticed just recently the words “Manufactured by Genetic Engineering” on the labels. Hmm. 7) Is that “(how good) (Turkish delight) tastes”, or “how (good Turkish delight) tastes”? Basic lokum isn’t very impressive, but the fancier varieties can be pretty good. 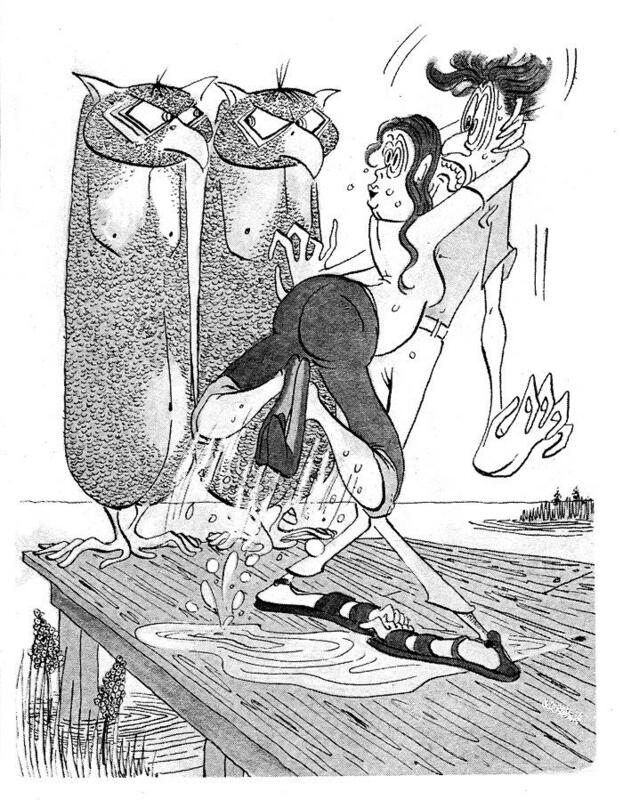 Here’s something I found in a futile search for the Don Martin diptych I used to gaze adoringly at in Ned Brooks’s upstairs gallery: some science fiction illustrations by Don Martin. I’d so buy a book of this stuff. 8) I buy a lot of marked-down candy at my local grocery store. In a recent batch was a big box of Sweethearts. They looked to have been made with a dot-matrix printer! (13) They develop a robot for this job and they don’t have the sense to name it Peter Piper instead of Harvey? John A Arkansawyer: Perhaps when favorite niche candies have gone, we will be able to have them at home with the use of confectionary 3-D printers. Or 2-D, in the case of Necco Wafers. 10. Greg: if and when you “review” any of my fiction, you WILL be positive…. ? I’m planning to at least read the first issue. From everything that I can see, it promises to be impressive. When can I order an electronic subscription from Amazon or Weightless Books? ISTR this is part of KSR’s “Science in the Capitol” trilogy. @1 is interesting as a stab but has a lot of holes, some obviously due to not understanding the differences of scale between 3e7 tourists/yr in Greece and 3e4 in Artemis, and some just strange (offering as an analogy a colonization allegedly ordered by an oracle?!?). @Camestros Felapton: how much can be laundered at that rate, and how much will be lost to HSAR.com? I don’t see these lining up, especially if the money is already sufficiently electronified to be useful — there are so many ways to play games with bits. @Heather Rose Jones: maybe they wanted to convince investors it worked by spooky action? @Kip W: I can so see those in the early Galaxy; the illos for “The Knights of Arthur” are spot-on. Chip Hitchcock: @1 is interesting as a stab but has a lot of holes, some obviously due to not understanding the differences of scale between 3e7 tourists/yr in Greece and 3e4 in Artemis, and some just strange (offering as an analogy a colonization allegedly ordered by an oracle?!?). Another being the failure to understand that the reason everyone has to depart from the Kenyan Space Center is that the Kenyan Space Agency owns Artemis (which is why their currency is the SLG from the KSA Bank) and thus has a monopoly on who gets to travel there, from their Kenyan Space Center, on their Kenyan Space Agency shuttles. He wrote 15,000 words requiring a lot of in-depth research, involving I can only imagine how many hours, and skimming through it, all I could think was how many books I could have read in the same amount of time. Then at the end he mentions being unemployed, so I guess he has the time to invest in this sort of intensive nitpicking. Which… hey, good for him. But I’d rather spend my time reading a book than reading his thought-intensive near-novella of reasons why future space tourism will perform the same way current Earth tourism does (something about which I am skeptical). I’m only about 50 pages in, but yeah, there is NO EXCUSE for setting a story in NYC, describing characters’ height, hair color, etc., and hardly ever mentioning their race. From the black character’s POV, especially, white people should be described as “white”, because that’s crucial info. John A Arkansawyer says I buy a lot of marked-down candy at my local grocery store. In a recent batch was a big box of Sweethearts. They looked to have been made with a dot-matrix printer! One of the fascinating places to find offbeat chocolate is the discount box stores as they’re called. The post-holiday periods in particular are where such oddities as the Ritter square containing corn flakes and lots of speciality Swiss ones including high quality white chocolate. Regarding that pirated Camestros Felapton… I went to iBooks earlier and the price Apple charged me for it was $0.00 — I even checked my pending charges and that amount was confirmed there. Can someone see how much it’s listed as in the US? Camestros says that the Australian iBooks lists it as costing $39.99. I’m in Canada, but for what it’s worth I see two, one free and one at $39.99. @Doctor Science – it’s worth pointing out, I think, that I grew up on E.E. “Doc” Smith and Sax Rohmer and similar bastions of political correctness, and that I, personally, am so whitebread that I live in constant dread of being sued by Hovis for trademark infringement. So if even I notice an issue with regard to diversity, the chances are fairly good that there really is one to notice…. @Cat Eldridge et al, there is a mobile URL for xkcd which has a touchable metacomment. Substitute “m.” for “https://”. ETA: Or add the “m.” after the https part. I had to do that to make this link work, but you don’t have to do that for a manual edit. Thanks for passing along the link to Sindbad Sci-Fi memorial page for Ahmed Khaled Towfik. I regret not having found out more about him sooner. Great to know that Amazing will include B&W art. It’s sad to see that diverse interior illustrations from the pulp years have no commercial support nowadays. But I think that pure draftsmanship will never die! Eclipsed for a while, perhaps, by the insistent buzzing of 3D animations and VR displays. But I still hold out hope that some day people will realize these electronic signals piped into our nervous system are aggravating and pernicious (*ahem* FB, no thanks! )… Then, the incredible lines and shades of Rembrandt, Durer, Degas, and our own Omar Rayyan, Virgil Finlay, Alex Raymond, will be a sight for sore eyes (sic). 8. Soon to be the Necconomicon? 7) Y’know, I’ve had canned peaches, and I can’t understand why anyone would eat that fruit under any circumstances. Peaches are slimy, sickeningly sweet, and all around gross. Why do people buy them? Note: the same applies to Turkish Delight: here’s a huge difference between a dusty box of year old Delight, and when it’s freshly made from the international market down the street. StephenfromOttawa says I’m in Canada, but for what it’s worth I see two, one free and one at $39.99. H’h. I got charged nothing which is apparently accurate as I signed up for a TB of Dropbox storage which is free for the first month and iTunes is showing the same charge for that. @Lex — I was very happy to see Finlay, Bok and Brundage nominated as Best Artist for this year’s Retro Hugos. @JJ: and even if KSA didn’t own Artemis, the scale of travel wouldn’t support multiple spaceports; that’s where his analogy to distributed air service went smash, at which point I figured it wasn’t worthwhile trying to work out what else was wrong. OTOH, it sounds like I was lucky to have visited Mykonos 50 years ago, before it was trendy. I made the mistake of trying Turkish Delight — which I had seen and heard raves about, from Narnia on down — before finding out what it was made of. I had to spit it out. I can’t stand rose perfume; to me it does not smell anything like the real flowers actually smell, it just smells terrible. And floral scents/flavors taste absolutely terrible to me. Rose flavor occupies the same appreciation hierarchy in my tastes as Marmite and Vegemite (as in, “No way in hell I will ever try that again” bad). PJ, I would be interested to smell that. But I probably couldn’t wear it. I think the problem is that not only am I extremely scent-sensitive — I can’t be around people who have doused themselves in cologne, and have to use scent-free laundry detergent and antiperspirant — I seem to have a particular problem with floral scents. I can’t stand rose perfume, I can’t be around real lilies of any kind, and lavender (which is supposed to be relaxing for most people) absolutely drives me insane. There’s a guy at work to whom I can’t be in close proximity, because the laundry detergent he uses is so heavily perfumed. As far as scents for things like hair products, lotion, and massage oil, edible things like fruit, vanilla, coconut, and almond, as well as eucalyptus, work just fine for me — but floral and many herbal scents have to be avoided. I have had to come home on numerous occasions and re-wash my hair thoroughly because whatever the hairdresser used is overwhelming and giving me a bad headache. But it’s a first world problem, and I’ve developed coping mechanisms (like having a pocket-size vial of Mentholatum with me at all times). I am thankful that I don’t seem to be actually allergic to any of the scents which bother me so terribly. (12) THE U.S. ARMY’S OWN MILSF. Once again I am reminded: just one small typo when looking for a sub-genre of Science Fiction and next thing, you find yourself in very NSFW (Not Safe For Work) territory. Soon Lee:….just one small typo…. Pre-appertain yourself a beverage of choice!